If you want to retain the period charm synonymous with wooden sash windows but want to put an end to rot, draughts and heat loss then look no further than Fortis & Hooke, the UK’s leading sash window repair company. Should I Repair or replace my Sash Windows? Whilst it may be tempting to answer this question by reaffirming the age of sash windows in period homes, this does not do justice to the complexity of restoring such features. In fact, sash windows are intricate and complex constructs that are made from several different pieces of timber, any one of which may become damaged, decayed, or unfit for purpose over time. Signs of damage can be difficult to identify and remedy, which can lead to a situation where some company’s advocate a full and complete replacement, but here at Fortis & Hooke we believe sash windows are worth saving. Our meticulous and sympathetic approach offers a far more appealing alternative to full sash window replacement. To underline our commitment to protecting character property features, we have established a cost-effective way of restoring decayed sections of your sash window without requiring the whole unit to be replaced. This unique method combines modern technology and materials with traditional carpentry skills, resulting in a durable and permanent solution that can stand the test of time. Sash window sills are particularly vulnerable to a variety of problems including rot and decay. Water tends to collect and settle at the bottom of sash windows, causing the paint to flake over time. This effectively opens pockets that water can penetrate, leading to decay. If you can identify water marks beneath the sash window that’s usually indicative of a rotten sill. These watermarks are generally caused by openings between the timber sill and the masonry sill. In some instances, this can be caused by bad sealing, but equally, this can also be attributed to rot. Regardless of the damage, a rotten sill is not always a cue for full window replacement. At Fortis & Hooke we can repair or replace any sash window sill with a new hardwood section, manufactured from hard and durable wood, which will serve as a permanent fix to an age-old issue. Similarly, the middle rail of your sash window is also prone to water damage and decay. This is the section that sits beneath the top opener and it plays a key role in driving the window’s functionality. Internal condensation can gradually cause this section to wear, leading to saturation, rot and decay. Once again, in most cases damage can be fixed and our team of window restoration experts will sympathetically repair the middle rail and return it to its former glory. Alternatively, we could replace this with a new, hardwood section, maintaining the functionality of the window as well as its aesthetic appeal. The bottom rail refers to the section of the bottom opener on a sash window. Issues arise when negligence and poor maintenance lead to superfluous putty or internal condensation saturating the rail and causing decay. Again, rotten rails do not always mean you need a full sash window replacement. 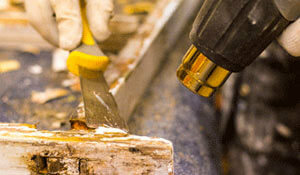 At Fortis & Hooke we prefer to repair or replace a bottom rail with a new hardwood section. This will resolve the problem and prevent unnecessary replacement. Sash Window Frames are also susceptible to rot-induced damage and we have dealt with hundreds of frame repair projects over the years. 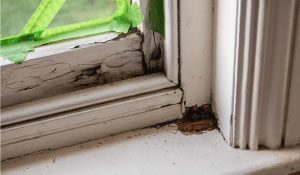 When it comes to identifying issues with your sash window frame, the most obvious signs of deterioration will usually present at the point where the frame meets the sill. Typically, you will encounter a tear between the two elements, which can cause water ingress and liquid accumulation. Over time this can cause gradual or pronounced decay, depending on the exact size of the tear and the amount of water that has saturated the frame. This type of issue is very common but our specialist team will complete the repair quickly and with minimum fuss. A repaired frame delivers durability and ensures that your sash window will remain impervious to inclement weather for years to come. All sash windows have construction joints, which can separate over time and become a major source of water ingress (causing paint breakdown and rot in the process). So not only must you check you sash window joints at regular junctures, but you must also ensure that they are repaired or restored at the first sign of significant decay. This prevents the long-term build-up of moisture, and ultimately protects the longevity of your newly- refurbished sash windows. Should problems arise our experts will quickly restore your joints and preserve the functionality of your timber frames, all whilst upholding the aesthetic quality that makes sash windows such an iconic feature. You Can Add Value to Your Home: In period homes, original features such as sash windows add genuine value to the property and actively engage buyers. By restoring damaged or decayed windows, you can strike the ideal balance between preserving the unique value of your home and ensuring that you promote a functional and stylish living space. Eliminate Noise and Draughts: We have already touched on how our combination of modern materials with traditional craftsmanship adds value to your home, but our approach also has practical benefits for home-owners. More specifically, our restored sash windows can be fitted with specialist glass to reduce noise, whilst our methods seek to eliminate draughts and rattles. Lower Your Energy Bills: If we accept the fact that restored sash windows will eliminate draughts, we can be confident that they possess excellent heat retention qualities. Refurbished sash windows reduce your reliance on artificial heating systems during the winter months, reducing your consumption and energy bills in the process. Like insulation, this can deliver huge savings over time whilst tackling the estimated 20% of heat that escapes through windows and doors.